The occasion was the feast of Our Lady of Mt. Carmel, who is the patroness of Chile, and it is only one example of devotions that I have seen in my many visits to that country, particularly in San Pedro. There was a teeming procession on Good Friday (with many statues); on the feasts of All Saints and All Souls, masses were held in the colourful cemetery with holy water liberally dispensed near the altar. Elaborate memorials to loved ones who had perished in car accidents are common by the side of the highway. On one occasion, I saw some kind of procession from a distance down the dusty street; later, when I asked my Chilean colleague what the occasion was, he said he wasn’t sure. “But Chileans like taking their saints out for a ride every now and then,” he added. 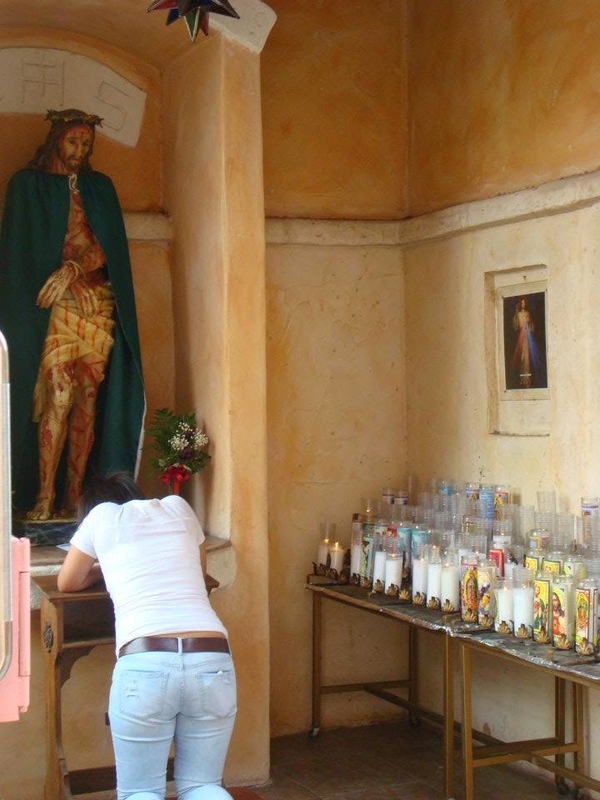 Compared to Catholic devotional practices in the English-speaking world, the amount of public devotion that one sees in a country like Chile is striking. What is just as unusual to us is the unaffected way in which devotions in these foreign countries are practised. There is no showiness and no embarrassment. People quite naturally flock to their favourite side altars in cathedrals; they light candles without looking self-conscious; the venerate relics and holy images with simplicity. What is it that makes us English-speaking folk less devotional in our Catholic faith? Are we missing something? Certainly one difference with us is that we tend to view religion as intensely private, so being seen doing “religious stuff” is kind of socially gauche. It’s awkward enough that we have to celebrate liturgy together in a church, and most of us are comfortable leaving it at that. But the Christian religion is most certainly more than a merely private faith: it is by its very nature corporate and evangelical. From the very beginning, praying and worshipping together has been an integral part of Christianity; from the mouth of Christ comes the command not to be ashamed of being known as his followers. Much of our hesitation to practise public devotions—an affliction from which I myself suffer—probably indicates that we lack courage or need to rethink the nature of our faith. Another factor is that in the English-speaking world, devotional practices are sometimes considered vaguely—or even explicitly—superstitious. It is true that devotional practices can slide into superstition, but I think in our culture we are not in much danger of this for the very reason that we are so aware of the possibility. More often than not, I suspect that it is an excuse to dismiss a particular popular practice than a real theological concern. After all, it is easier to label something as superstitious than to confront what it is about it that makes us uncomfortable. If we can get over these two mental blocks, I think we will find that there is much in devotional practice to assist us in feeding the spiritual hunger so prevalent in our culture. The fact that many Catholics come out of the woodwork for the Ash Wednesday and Good Friday liturgies is probably significant in this regard. Both of these celebrations are highly symbolic and engage the senses. Their ritual helps people feel as though they are connecting to something larger than themselves, in ways that we should be paying attention to if we want to minister better to the People of God. A further clue as to our hunger for devotional practices is the current renaissance of Eucharistic Adoration in North America. Both at the Rise Up conference I attended a couple of years ago and at the Hearts on Fire retreats I participate in, many participants spoke about encountering Jesus most deeply during this devotional practice. Far from detracting from the true religion, Eucharistic Adoration drew them closer to God and to his sacraments, particularly to the Eucharist and Confession. Devotional practices aren’t the whole of faith, but perhaps they are something we should look at with fresh eyes. In order to do so, the rest of the articles in this Ibo series will focus on particular devotional practices and what they have to offer us today. Not all are necessary for everyone; none are a replacement for personal and private prayer or participation in the sacraments; but they are a gift given to the Church that perhaps we may explore.